I have been living in this City of Joy, Calcutta, for more than twenty three years, as of today, and have since scanned the length and breadth of the city in search of good food, which the city by itself is renowned for. Often, my overall experience has been at par with the expectation of the 'low price great food' tag that Calcutta has earned over these many years. However, apart from that minimum 'low price good food' requirement, I eagerly look for an above-the-average food experience. 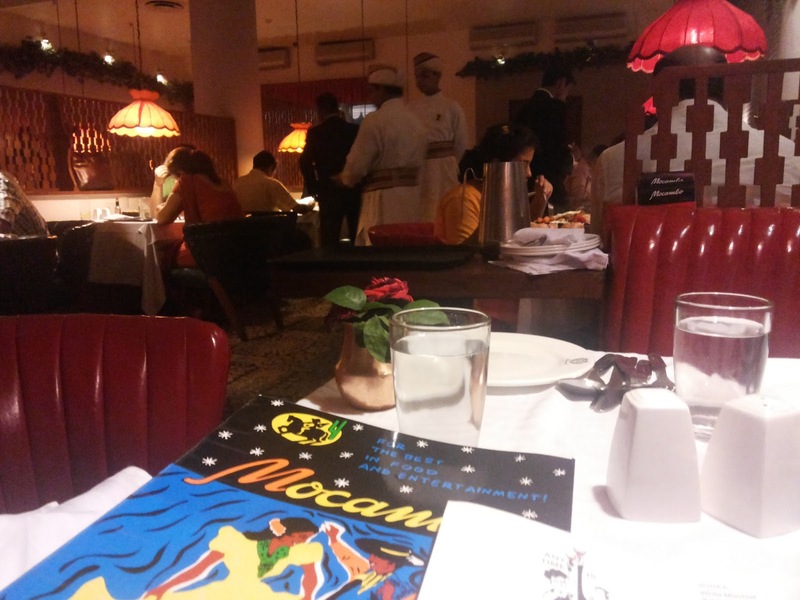 In my ever going process of the food hunt in the city I have somehow, shockingly, missed out on one of the must visit restaurants, the legendary Mocambo, located at downtown Park Street. Coincidentally, the same story ran with my wife. Even she had never gone to Macombo in all these years of her life in this city. 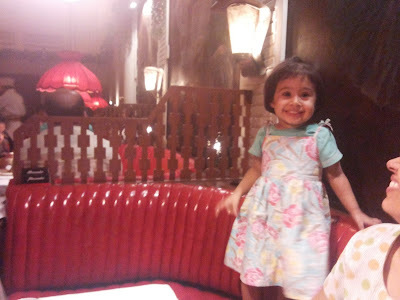 Having tied the culinary knot along with our matrimonial one and having the luxury of being relocated to Park Street since a year now and, moreover, being a husband-wife duo food bloggers, not visiting Mocambo was a foodie crime that we have been committing so far without being penalized for it. 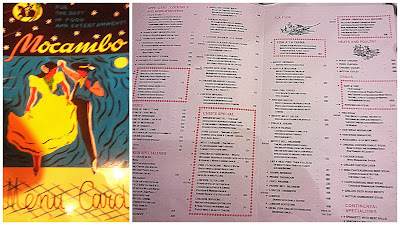 The ambience at Mocambo wore a very classy English touch which replicated the 1956 AD established British Calcutta. The lighting was soft and adequate. The air was well circulated and didn't have intrusion of the pantry ventilation. The service staff were very courteous and polished. Overall a very pleasant ambience with a fine finesse. Coming to the menu, I was very pleased to find a not so usual menu card. What I mean by that is on any other regular continental restaurant I would find the usual steaks and fried fish with chips sort of menu. Though they might be great, I look for a 'never tried before' dish on the card. So the menu card, to start off with, was a pleasant change. I had to brain storm a bit to decide what I would opt for. 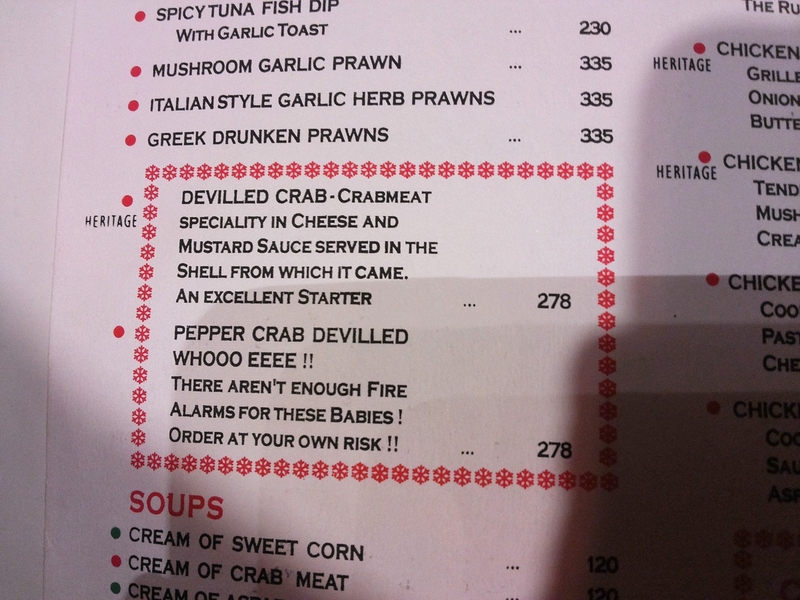 The entrée we decided to go for was Cream of Chicken Soup and Devilled Crab. 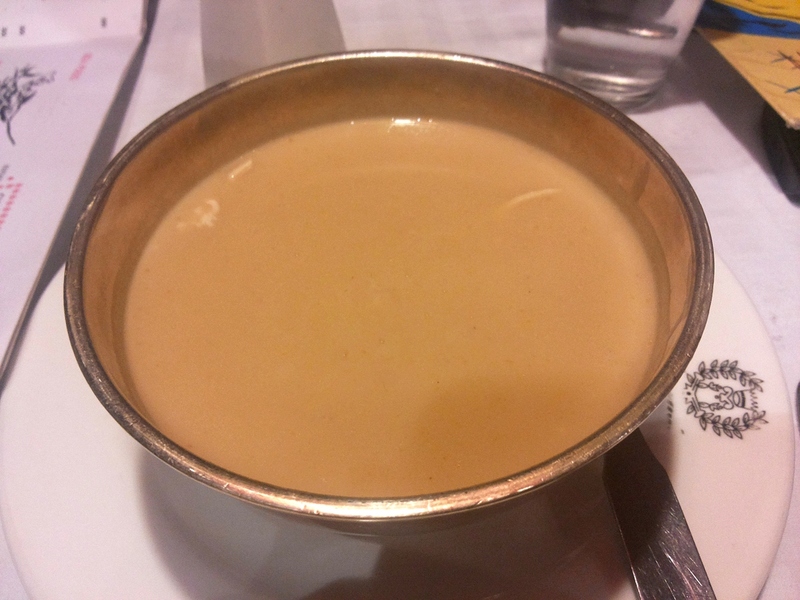 The soup looked simple without any additional garnish or accompaniment such as soup stick or bread. It was of thick consistency and rich in cream. The chicken was very soft and tender. It was well seasoned. Devilled Crab was one of the three heritage dishes we ordered. 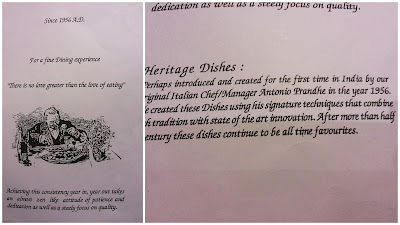 Heritage dishes are apparently the ones that was for the first time introduced in India by the very founder of Mocambo, Italian Chef/Manager Antonio Prande, back in its inception in 1956 AD. 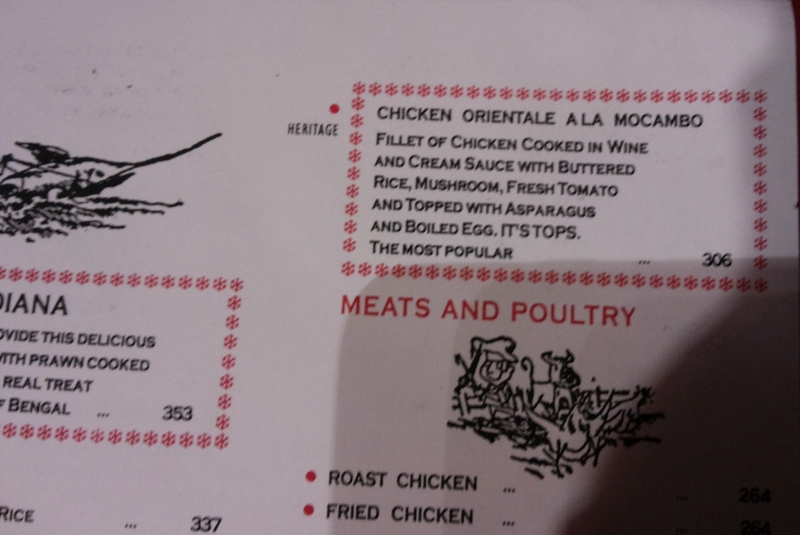 In the menu card those dishes are in the red coloured box. 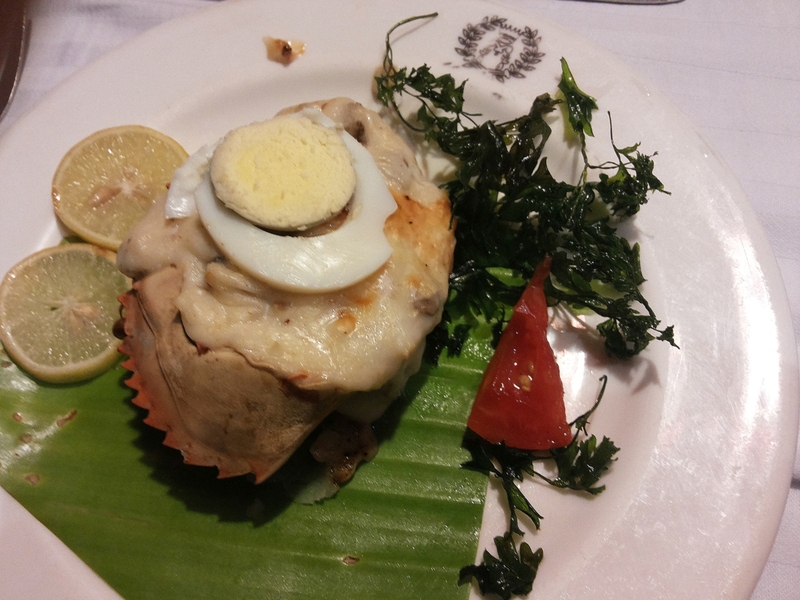 The crab meat in cheese and mustard sauce was baked in the crab shell itself. It had an interesting presentation as it came with a slice of boiled egg and lemon and semi fried parsley and a tomato wedge served on a banana leaf. Although I could not find the correlation between the lemon slice, sliced boiled egg, tomato wedge and semi fried parsley to the crab, I was nonetheless happy with the presentation. The devilled crab was soft in texture with delicately diced button mushroom and an adequate cheese topping. As good as it was, I felt it could have been a shade better with more crab meat in it. Certainly worth every penny. 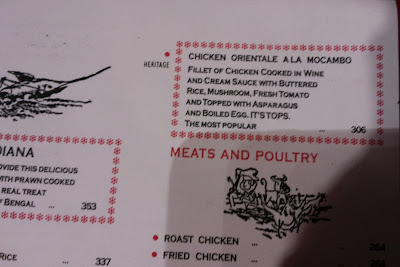 For the main course, we went for Fish A La Diana and Chicken Orientale Mocambo, both being the heritage dish of the restaurant. I choose the fish dish because it sounded something different. 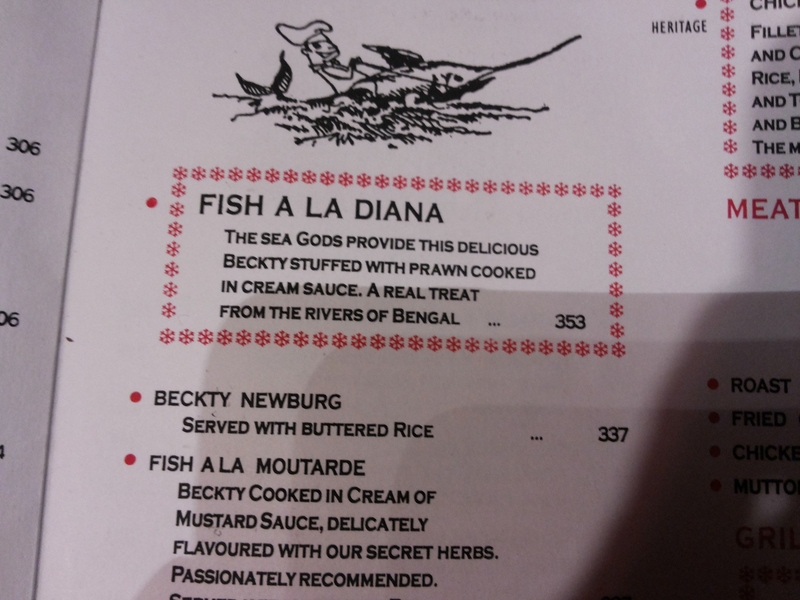 The menu read 'beckty stuffed with prawn cooked in cream sauce'. 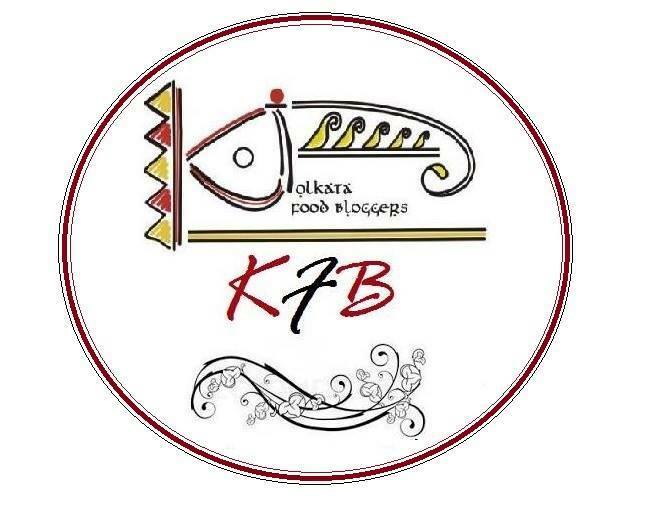 Calcutta Bhetki (as I would spell it), is an amazing single bone fish that makes amazing fillets for steaks, fish fries etc. The idea of stuffing prawn, my another favourite, sounded like a good combination to try. My wife decided to go for Chicken Orientale Ala Mocambo which was fillet of chicken in wine and cream sauce, served with rice. Look-wise, the fish won hands down over its chicken counterpart. 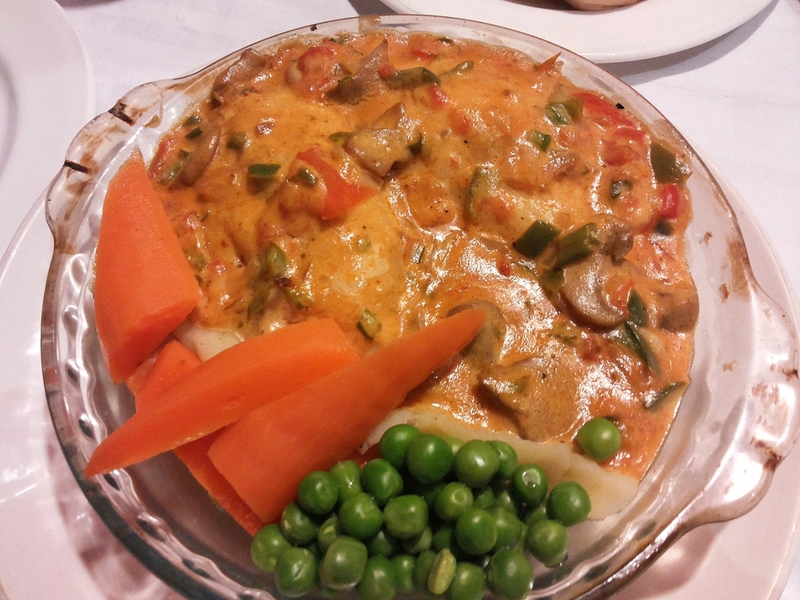 It had a beautiful red gravy with an awkwardly cut carrots,which was acceptable, and green peas. The mushrooms had an appetizing effect on the whole dish. The chicken looked disappointing and the presentation was somewhat on the lines of the Indian cuisine more than a continental one. 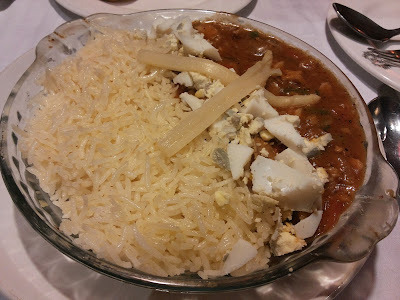 It had a brown gravy on one side and rice on the other, divided by a cluster broken boiled eggs, which, I presume, they used it from the remaining portion after serving out the sliced boiled egg on the crab starter. However, after digging into the dishes the weight-age changed substantially in favour of Chicken Continentale Mocambo as it truly tasted a class apart. It had a beautiful balance of flavours and entailed a subtle yet pronounced trail of the chenin blanc wine. The rice, smeared slightly in butter, complimented extremely well. 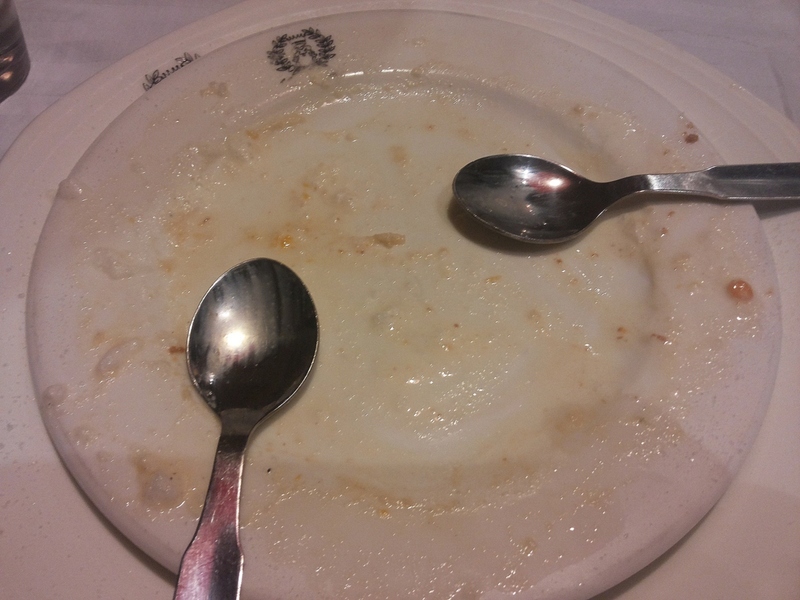 It was seasoned well and was truly a dish we had never tried before. 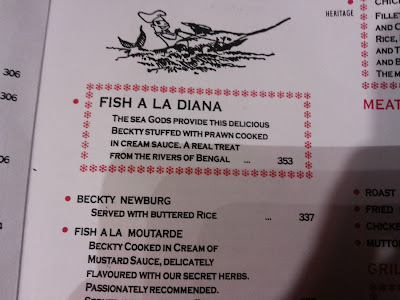 The Fish A La Diana was a huge let down. Firstly it was not the Calcutta Bhetky I was looking for. I presume it was the Bombay version of the bhetky which apparently tastes not one third as good as the original Calcutta Bhetky. Moreover, the fish was minced and then stuffed with prawn. Both the fish and the prawn was absolutely bland with no seasoning at all. The red sauce had a strong tomato acidity which not only didn't suit my palate but was also not in line with the overall ideology of the dish. I couldn't even finish half of it. Maybe it was one of those days when they got it wrong and on other days it would have been good but unfortunately I, as a reviewer, was at the receiving end on that day and I wouldn't ever go for it again. 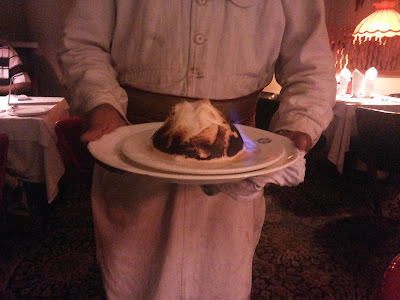 Coming to the dessert, Amrita opted for baked Alaska. The dish was very artistically incorporated and the flame effect from lighting the brandy poured around it was very dramatic. 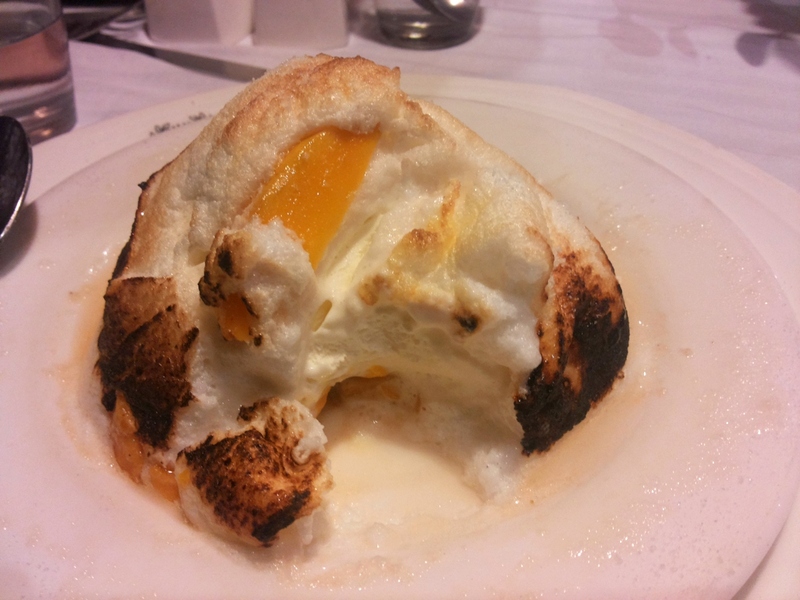 It had a beautiful layers of a sponge cake smeared with strawberry jam and loaded with fresh chopped mangoes topped with a scoop of vanilla icecream. All of this was covered with meringue which was baked. 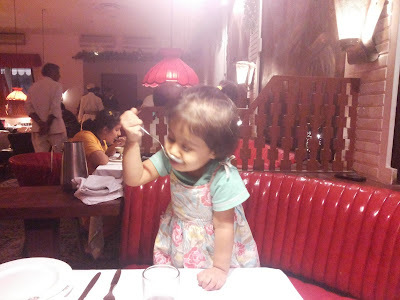 Our daughter, Vaanya, loved it as well and it was polished off in no time. Overall, Mocambo was a very beautiful experience. Except for the disappointing fish dish everything from its ambiance to service time was very good. The bill came about around Rs. 1600/- which, for the two of us, was worth the food and the experience we had. I would generously rate it 6/10 with 10 being the benchmark standards kept at MasterChef Australia. I would like to sign off the review by reiterating the famous Bollywood dialogue which reflects our dining experience here. PS: I apologize for the poor picture quality since it was from the mobile phone and the lamp above our table caused shadows. Disclaimer: This is an independent and unbiased review. The reviewer was not paid and was not obliged to comment either favorably or unfavorably. 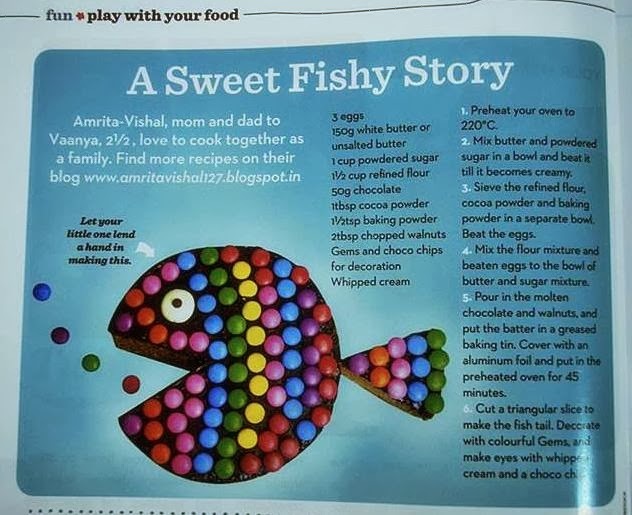 nice review Amrita, and the little girl is soo cute..liked ur facebook page as "The Pick'y Bank"..hope u like mine too. That crab is exciting,also the thick creamy chicken aoup, quite popularly available over here. Definitely worth the price, maybe the plating was a let down for one or two dishes. Over here in Malaysia, we have all sorts of restaurants, all sorts of street food until we can't decide what and where to eat. Again, the more posh the place, the higher the bill will be. Loved this review. Crab dish is very interesting and delicious. The baked Alaska looks like a must to complete this wonderful dining experience. No wonder your daughter is happy diner!